Our primary research goal is to combine two complementary approaches of complex systems and data science. 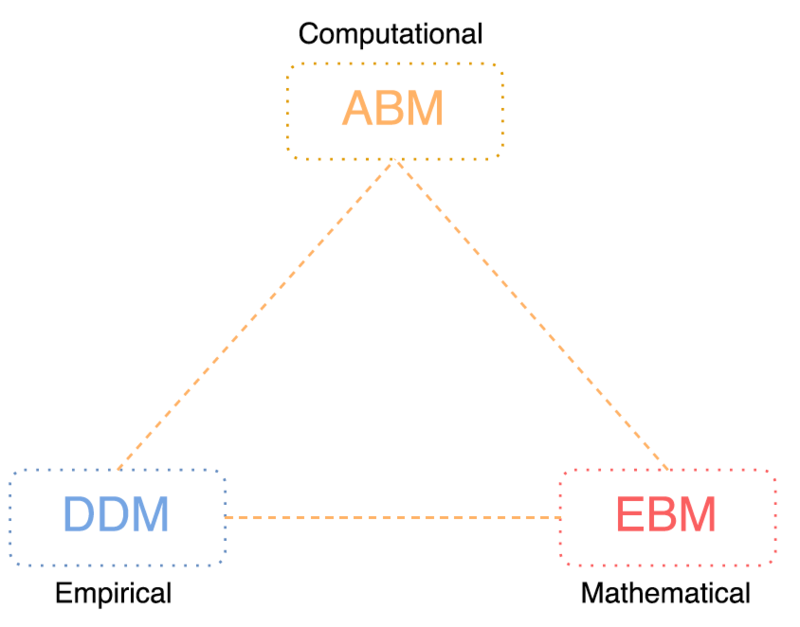 We try to make use of three modeling techniques: ABM - Agent Based Modeling for computational research, EBM - Equation Based Modeling for mathematical research and DDM - Data Driven Modeling for empirical research. Until now, we have generally worked on simulations of social systems, via agent-based modeling, in the context of theoretical game theory. We verified our results using equation based modeling tools such as markov chains, phase plane analysis, etc. From now on, we want to incorporate data science and machine learning in our complex systems research. One way to combine these fundamental tools is to use data science to improve complex systems research. We use machine learning to process data and determine model parameters of an Agent-Based model. 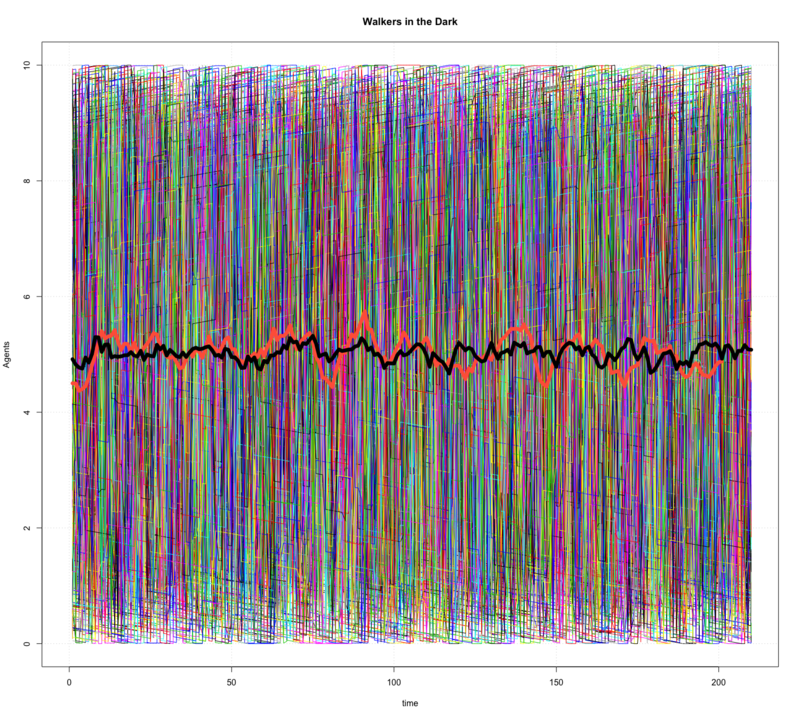 This is called as data-driven agent based modeling. We also want to use our knowledge on complex systems such as complex network analysis, agent-based modeling for the classical problems of data science such as prediction and classification. 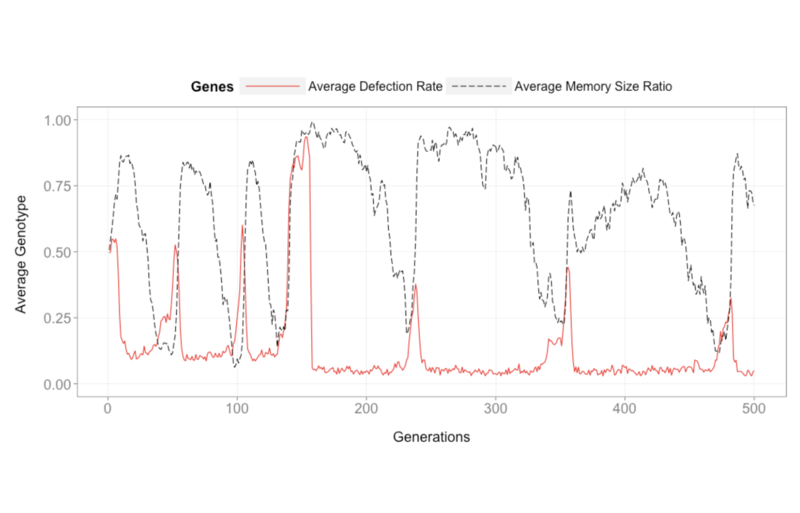 Greater memory size is unfavorable to evolutionary success when there is no threat. In contrast, the presence of an appropriate level of threat triggers the emergence of a self-protection mechanism for cooperation. This work is published in Advances in Complex Systems, 2017, DOI: 10.1142/S0219525916500156. In this study, we investigate the impact of advertisement pressure on a cultural market where consumers have a limited attention capacity. This work is published in Physical Review E (PRE), 2014, DOI: 10.1103/PhysRevE.90.032801. 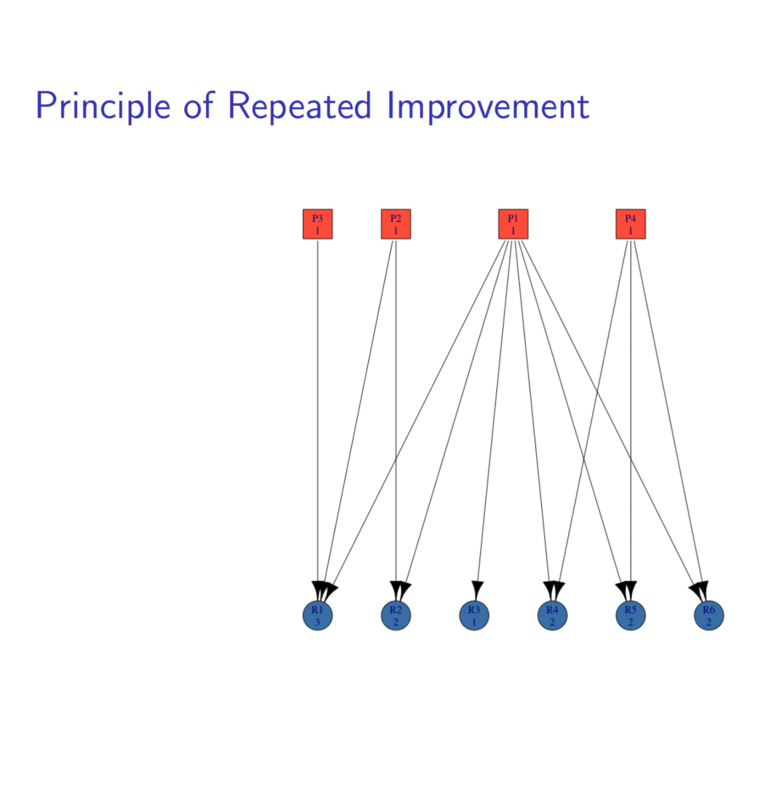 In order to beat defection, players do not need a full memorization of each action of all opponents. There exists a critical memory capacity threshold to beat defectors. This work is published in Condensed Matter Physics (CMP), 2014, DOI: 10.5488/CMP.17.33001. We work with NLP team of Işık University to investigate the co-occurance graphs of Turkish newspapers & writers to extract some pecularities of the writer, based on complex network analysis. How to quantify simultaneously the prestige of assessor and the quality of assesses. In contrast to well known HITS algorithm, we consider prestige as neither making an abundance of assessments, nor making a scarcity of assessments but somewhere in between. Darpa announced a "New program seeks to develop simulated social systems of varying complexity against which to test the accuracy of social science modeling methods." Aim is to creating artificial but socially plausible simulations with causal ground truth to quantify the explanatory and predictive performance of a range of social science modeling methods. This project has started with Marco Pangallo and some other fellows in Santa Fe Institute during CSSS2017. In Jeremy's words, "How novel sub-communities (i.e. Sufis) arise from relatively "stable" network structures (i.e. hadith-transmission or ascetic communities)."" What can complex network analysis tell us about the emergence of novel communities? Can ABM give us insights about it? This project has started with Jeremy Farrell and some other fellows in Santa Fe Institute during CSSS2017. 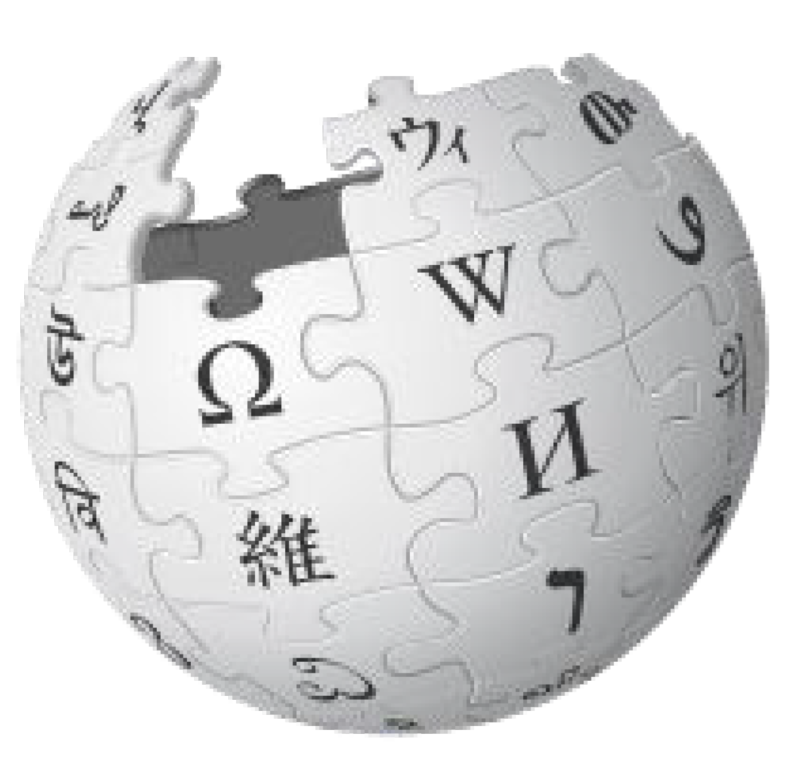 Consider each article as a node and article’s links to other pages as edges of a sub-network. 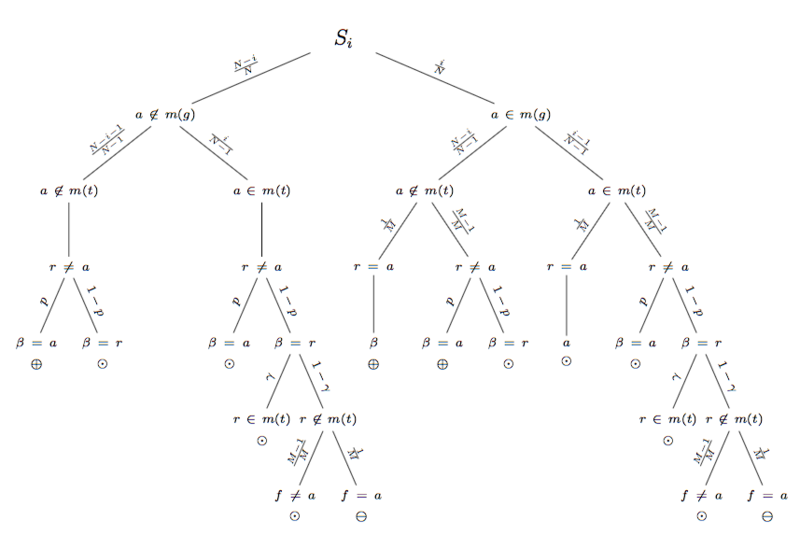 Different languages has a different or maybe similar sub-networks constructed from a given particular node. What does network structure reveal about cultural differences? This project has started with Kyle Lemoi and some other fellows in Santa Fe Institute during CSSS2017. We deeply believe in the importance of an interdisciplinary approach for making a better scientific research. The ability to work on qualitative social problems by the means of the mathematical and computational tools is marvelous. If you are interested in one of our projects, or you share the same hunch for your own projects, please feel free the contact us. We would be happy to collaborate. Eğitimlerin kalitesini arttırmamıza ve daha geniş kitlelere ulaşmamıza yardımcı olmak isterseniz, bizimle iletişime geçerek bize bağışta bulunabilirsiniz. © 2017 Dr. Uzay Çetin.